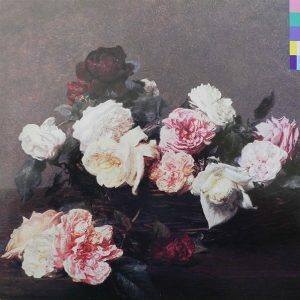 In just three years, we’d gotten to the point where the most atypical song on any New Order album would be the one that sounded the most like a Joy Division callback — in this case, “Isolation” from Closer — and yet was still a showcase for their progression, both musical and technological. And so it was with “Your Silent Face,” six minutes of utter bliss that slowly rumbled out of the beginning of side two of Power, Corruption & Lies. The synth wash that Gillian Gilbert plays is so lovely and evocative, I used it for at least one music bed while doing promos for KFSR. That synth wash is followed by Bernard Sumner playing a short solo on the melodica, a hand-held keyboard that you blow into, and an instrument I still primarily associate with reggae records. The thin, lonely sound of the melodica made a nice contrast with the majestic synths and full-on drum machine beat, not to mention Sumner’s downbeat lyrics. And while “Your Silent Face” is mostly dominated by the electronic elements, it wasn’t really a dancefloor song: more like a chill-room song where even the Peter Hook bass runs hew close to the main melody, and Sumner’s guitars don’t ever really get scrappy. But none of that matters: one of the strengths of the album cuts on New Order’s mid-1980s albums is that they continued to experiment with tones and sounds and rhythms while developing a trademark sound. And so while “Your Silent Face” didn’t sound at all like “The Village” or “Age of Consent” or “586,” when Hook and Sumner circled each during the instrumental breaks, it was still unmistakably New Order.